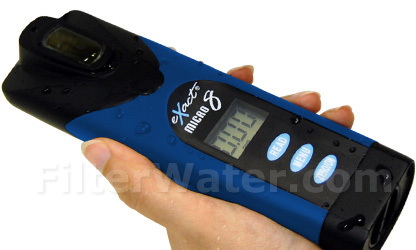 eXact Micro 8 Water Meter - Test for Fluoride, Cyanide, more! 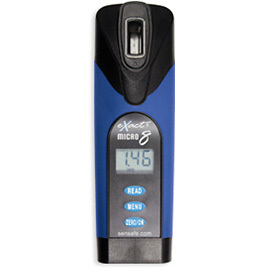 The eXact Micro 8 Water Meter offers direct water testing capabilities for Cyanide, Total Iron, Ferrous Iron, Ammonia, Phosphates, Fluoride, BT-pH, Sulfide and % Transmission, which allows for testing of 8 different water quality parameters. 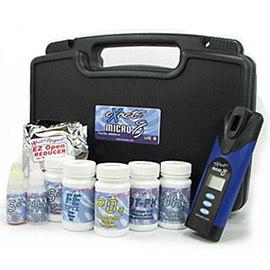 Patented technology with EZ-3 easy 3-step testing method produces results on the spot! Discontinued product. Please look at eXact iDip and eXact Micro 20 for features. The eXact Micro 8 Advanced Photometer is using wavelength that's selected in order to indentify specific water contaminants. It is a faster, safer, easier and very precise testing meter. 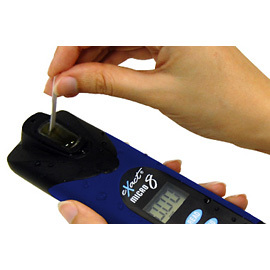 It's ideal for residential, commercial, and municipal water testing, and also for testing fluoride. 4 mL sample cell is smaller than ordinary 10 mL cells on the market, allowing for smaller device that fits in any hand. Q: I found test strips that work for fluoride. Why do I need a Photometer? A: We've been on the market for a while, and so far we have not found a test strip that works at home or in the field that doesn't require a chemical reagent or a photometer for accurate, repeatable results.